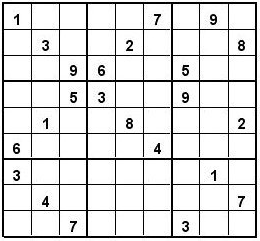 I admit to being unreasonably pleased with the following trick: The KenKen solver we’ve built and tuned can be generalized to solve Sudoku, including jigsaw Sudoku, with a 9-character change to its source code. The only change is the addition of the ‘s’ -> Set mapping in the lut dictionary. This change will let us define uniqueness constraints in our puzzle definitions. It is a little cumbersome to use the solver in this way; in particular, our puzzle description language isn’t well suited to puzzles with so many constants. It works, though. 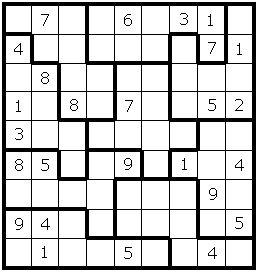 Of course, using the solver this way is really silly; not only is our puzzle description language poorly suited to listing all those constants, but the cage constraints are implicit in regular Sudoku, and don’t need to be specified. I still think it’s neat that the code can be so easily made to support these additional types of puzzles.